Prayers are Groups A & D: (See https://remnantdisciplesjtm.com/crusade-prayer-group-format/ for details). When his mother’s kin repeated these words on his behalf to all the lords of Shechem, they set their hearts on Abimelech, thinking, “He is our kin.” They also gave him seventy pieces of silver from the temple of Baal-berith, with which Abimelech hired worthless men and outlaws as his followers. He then went to his father’s house in Ophrah, and killed his brothers, the seventy sons of Jerubbaal, on one stone. Only the youngest son of Jerubbaal, Jotham, escaped, for he was hidden. Then all the lords of Shechem and all Beth-millo came together and made Abimelech king by the terebinth at the memorial pillar in Shechem. Hear me, lords of Shechem, and may God hear you! 21 Then Jotham fled and escaped to Beer, where he remained for fear of his brother Abimelech. My dearly beloved daughter were it not for My Patience, My Punishment would be inflicted now upon the unjust who scourge My Church on earth. The hatred against Christianity is being inflicted upon you in three ways. The first is the global apostasy, which is spearheaded by My nemesis who deceives the world into rejecting all that is of Me and tossing Me onto a wasteland left to rot. The second comes about because of the rationalism and human interference in My Word,spread by scholars of My Word who are not filled with the spirit of Truth but who are, instead, stuffed with self-righteousness, which is fuelled by pride. So well versed do they believe they are in interpreting My Teachings that they will add in new codicils and adjust what I taught to suit their own selfish needs. And then, there are those whose hearts are made of stone – cold, unfeeling and filled with a deep intense hatred for Me and anyone who practices Christianity for all to see. The influence of the devil is manifested in so many ways that man, alone, will be incapable of withstanding the demands made upon him by all of these three groups who will try to stop him from proclaiming the True Word of God. My Word, they will say, causes so much offence that it will be deemed to be politically incorrect and so this will be given as the main reason to radically change the face of Christianity. Only the simple, the people whose love for Me is likened to that of little children, will be loyal to Me because the rest will be too busy implementing the changes regarding the interpretation of My Word. And all during this time, the priests whom I have called to bear witness to the Truth will be preparing to preserve the Truth. To hide the Truth will bring about a terrible darkness. To change it is a mockery of My Crucifixion. To present a substitute for the Truth is to deny Me completely. Yet, the greatest perpetrators will be those who boast of their knowledge of Me – their holiness masks falsities and their words and actions will never draw you to Me for the Holy Spirit will not be present in their souls. When the Holy Spirit is not present they will – these traitors of My Word – draw out the darkness in others who will enthusiastically embrace their lies. All of these falsities will bear the sign of the evil one – the sin of pride – the doorway into the desert. Once this door opens all other iniquities will flow through and the souls of all those who succumb to the heresy will become barren. Without the Truth you will live in a world where nothing you hear will bring you peace. Without the Light of My Presence the sun will not shine– it will become dull and languid and then it will become a haze until, by the hand of mortal man, it will fail to bring light so that those who have eyes and who refused to see will no longer see, while those who saw and accepted the Spirit of God will see. My dearly beloved daughter, I must emphasise, to all those who believe in Me, that is important to pray for each of your nations. Use this group to recite all the Crusade Prayers given to you. My daughter, Maria, will arrange to have those put up in a way which will allow you to print them off anywhere you are in the world. Please spread My Holy Word to all members of the clergy. Some will reject My Messages. Others will embrace them with love in their hearts. However, for the most part, you will be ridiculed and rejected in My Holy Name. You will suffer as My apostles suffered and will be made a laughing stock in some quarters of My Church on Earth. These verbal and abusive insults will be intense and you will be hurt. But, I say this. Remember the hatred shown to you will prove that it is, indeed I, Your Jesus, speaking to you from Heaven. For this suffering I will make you rise again and again every time you are kicked to the ground. I will raise you up and make you stronger than before. Why do I do this? I do it so that you will become fit and stronger to spread My Holy Word. For only then will you receive greater Gifts, which I will provide you with through My Holy Spirit. So rise and move to prepare your nation, so that it will receive the armour it needs to avoid the mark of the beast. Never forget the importance of the Seal of the Living God. It will offer you and your family protection, not just in spirit, but a physical protection also. You are blessed to receive the Seal and it is your duty to ensure that as many of God’s children everywhere receive it. Remember I stand by all of My followers, every minute and when they carry out My Work, they will receive special Graces to make them brave, strong and determined to save the souls of every man, woman and child in the world. And they called Barnabas, Jupiter: but Paul, Mercury; because he was chief speaker. The priest also of Jupiter that was before the city, bringing oxen and garlands before the gate, would have offered sacrifice with the people. Which, when the apostles Barnabas and Paul had heard, rending their clothes, they leaped out among the people, crying,  And saying: Ye men, why do ye these things? We also are mortals, men like unto you, preaching to you to be converted from these vain things, to the living God, who made the heaven, and the earth, and the sea, and all things that are in them:  Who in times past suffered all nations to walk in their own ways. Confirming the souls of the disciples, and exhorting them to continue in the faith: and that through many tribulations we must enter into the kingdom of God. And when they had ordained to them priests in every church, and had prayed with fasting, they commended them to the Lord, in whom they believed. And passing through Pisidia, they came into Pamphylia. And having spoken the word of the Lord in Perge, they went down into Attalia:  And thence they sailed to Antioch, from whence they had been delivered to the grace of God, unto the work which they accomplished. And when they were come, and had assembled the church, they related what great things God had done with them, and how he had opened the door of faith to the Gentiles. And they abode no small time with the disciples. My dearest daughter, the world has awaited this moment for two thousand years. Some with fear in their hearts, others with anticipation and wonder, as to when this moment would come, and now it has. I Am the God for whom all of My children are crying out, in these terrible times. It is I, to whom, they, My distressed children, must call out for now. Children do not be afraid. No harm will come to those who wear My Seal, the Seal of the Living God. Satan and his fallen angels, who infest the world at this time, do not have the authority over those who have the mark of the Living God. You must listen to Me, children, and accept My Seal, for it will save not only your lives, but your souls. Recite the Prayer to receive My Seal every day. Your love for Me, your heavenly Father, will be your saving Grace and it will give you the strength that you need. My Seal of Protection is foretold, as the Second Seal is broken. The rider of the red horse is the avenging dark angel, who will slay My children in the many wars to come. But he will pass over those of My children with the Seal on their foreheads. My dear children, when you feel downhearted, discouraged and fearful because of the terrible injustices you witness, please ask for my powerful protection. I will intercede, on your behalf, and ask my Son to hear your pleas for peace and calm. 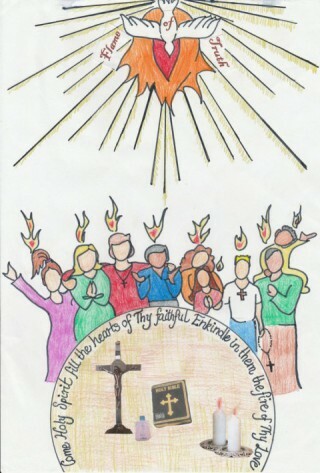 He will fill you with the Graces needed to persevere and keep alive, within your soul, the flame of the Holy Spirit. If you seek the Gifts of the Holy Spirit and my Son responds to your call, your faith in Him will be strengthened greatly. Once this happens, your faith will enable you to trust more in His Great Mercy. Faith is the foundation of the church, by which it can remain strong. Faith rids you of fear and despair. It will bring you comfort, peace and calm in turbulent times. It allows you to see things clearly as you are meant to, so as to protect yourselves from the persecution you have to face every day. Those who are devoted to Jesus Christ will always have to endure the pain of His suffering. This is something you have to accept when you follow in His Footsteps. When you accept this Cross you must then hand over your suffering to my Son, for the salvation of the souls of those who would never be able to enter my Son’s Kingdom, otherwise. Your sacrifice, while it may be difficult, brings great joy to my Son who weeps in great sorrow for those He will lose to the evil one on the last day. Faith, hope and trust in my Son will alleviate your suffering and bring you peace and joy. It is when you receive these Blessings that you will know that you have crossed over every barrier, which separates you from God. And, for that, you must be thankful – not sorrowful – for the Kingdom of God will be yours. Go, my children, to love and serve my Son. but you will never denounce Me or reject Me. For this you will be given Gifts. will render you invisible to your enemies. Recite it every day from now on. and have it blessed by a priest. for the day of the fallout in Europe is not far away. “… Non-believers, who up to now, had no interest in Christianity, will be drawn into the so-called new one world church. Along with all other religions, which do not spring from the Truth, they will scoff and sneer at the children of God, who will remain true to the Word of God. 3 Saying: Hurt not the earth, nor the sea, nor the trees, till we sign the servants of our God in their foreheads. Possibly because we read and pray the prayer (with our minds) and commit to it with our wills. (If you tap your forehead you are referring to your mind). The mind is not just intellect of course, or just memory, but all of this, including your will. We must also remember (with our minds) to pray it daily- to accept the Seal daily. Lastly, also note the detail that an angel “carried” the Seal. It is as if it is an object, like the picture of the Seal and/or the written prayer. I read somewhere else that the Mark on our foreheads is the mark of the Holy Spirit. The bible doesn’t say it is a mark – just ‘a seal’ on our foreheads which offers protection. 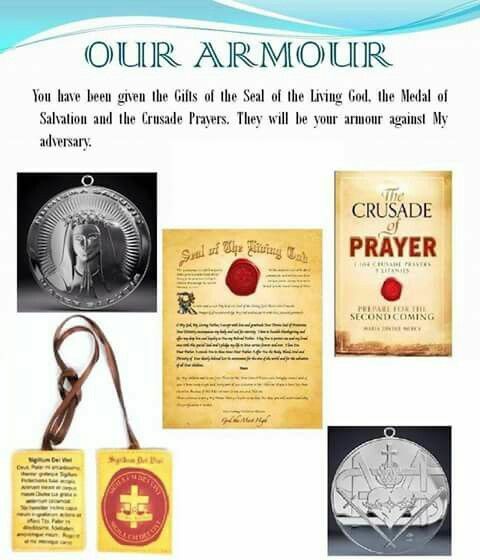 There are various messages (click on menu item ‘Seal of the Living God’ page) which explain this protection and other benefits of the seal.